An Oklahoma State University Extension agent providing a client with working knowledge. The whole concept of Cooperative Extension baffles most people. As I’ve pointed out a time or two, relating this concept to novices is as challenging as explaining all the complexities and nuances of the British Commonwealth. As realities go, this is not good, especially considering the densely crowed, flattened information landscape on which we Extension professionals operate today. Cooperative Extension’s murky image was luxury we perhaps could afford throughout much of the 20th century, when we occupied a much more conspicuous place within the American intellectual, cultural and public policy landscape. Today, such murkiness is crushing burden that poses a genuine threat to our survival—precisely why I’ve argued more than once in this forum that the times are calling on use to go axial. By axial, I mean that we Extension professionals are being challenged as never before to define what lies at the core of our being — to put it another way, to identify those attributes that constitute the essence of who we are and what we do. Actually, I don’t think that identifying these core attributes is as hard as many people imagine it to be. While some of my colleagues may write me off as delusional, I’m more convinced than ever that the essence of Cooperative Extension work can be expressed in this simple term: working knowledge. Working knowledge is what Cooperative Extension is about — what it’s always been about — providing people with practical, beneficial knowledge to make lasting, meaningful improvements in all facets of their lives, whether this happens to be at home or work. 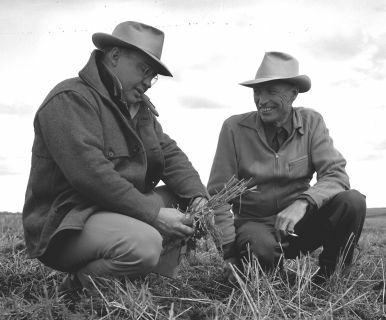 This axial principal of Cooperative Extension, which has been employed to serve people from many different races and backgrounds in every corner of the planet, started out a preoccupation of farmers in frontier America — farmers who were seeking working knowledge to help them farm more effectively and profitably. The perennial question remained how — how to disseminate knowledge to the widest number of farmers at a time when the farming population was growing and spreading rapidly across a vast continent. Farmers’ meetings and institutes, the Morrill Act of 1862, Seaman Knapp’s demonstration plots, Booker T. Washington’s Movable School, corn and tomato clubs — all of these efforts and many more have essentially comprised a running dialogue about the most effective ways to put practical, beneficial knowledge to work on behalf of farmers where they live and work. All of these efforts coalesced into the Cooperative Extension movement, which was formalized with the passage of the Smith-Lever Act of 1914. Through this legislation, states were provided matching funds to establish statewide networks of county farm educators, each network functioning under the aegis of its state land-grant college, each the byproduct of an earlier national effort to provide farmers with working knowledge: The Morrill Act of 1862. Simply put, passage of the Smith-Lever Act marked the culmination of a century-long movement that from its beginning sought to impart working knowledge to farmers. As it turned out, the movement didn’t stop with farming: It underwent further refinement and adaptation. Ultimately the working knowledge concept was re-engineered to address the needs of many people from many walks of life with many diverse needs. In time, it developed into one of the most grassroots educational movements in history, emulated the world over. Working knowledge: that, as I see it, is the axial principle of Cooperative Extension, the essence of who we are and what we do.